Are you looking for an alternative to repetitive time-killers like Angry Birds or Candy Crush? 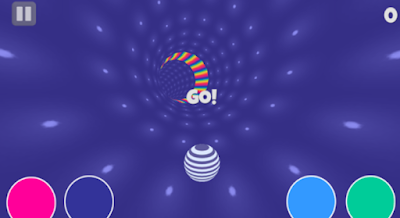 Take a welcome detour with a truly engaging and interesting action game, “Rainbow Ball Challenge” that is the right pick for you. Rainbow Ball Challenge is the action game that you would love to play in your leisure time because of its fast and challenging game play. The game offers you the high quality 3D graphics and smooth user interface. The controls for the gameplay are well-defined can you can find these on the game screen. The game theme is revolves around a stripped ball and an endless tunnel. In order to score the best possible points and keep on moving through that tunnel you must have to possess a quick attention skills and the best hand to mind coordination. You have to change the color of the ball according to the tunnel’s color by using the control buttons embedded on the game screen. The right time for changing the color of ball is then, when you enter the tunnel with rainbow colored tunnel. The speed of movement of the ball changes as you move forward in the tunnel, which makes this game more challenging and here it demands you quickly to manage your focus and response time. You can also share your best scores with your friends to challenge them and the game also offers customized setting for background sounds, it is available free to download for your Android devices and can be downloaded from the direct download link given at the end.